Definition - What does Half Lotus in Shoulder Stand Pose mean? Half lotus in shoulder stand pose is an inversion that is a combination of shoulder stand and half lotus poses. 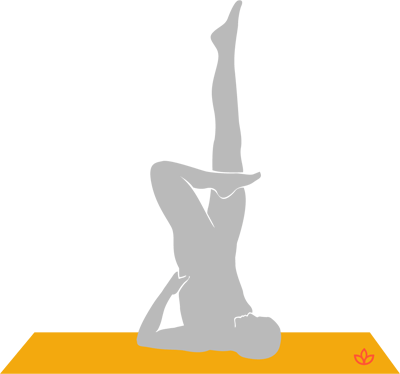 To enter the pose, begin in supported shoulder stand pose by lying down, face up and raising the legs and hips overhead. Support the hips with the hands coming into shoulder stand. Now bring the legs to cross in half lotus. Hold for a cycle of six to eight breaths then mindfully bring the hips to the ground. Repeat, switching the crossed the legs. Half lotus in should stand pose is also known by its Sanskrit name, ardha padma sarvangasana. For a more challenging expression of the pose, try half lotus side shoulder stand pose by leaning the legs and hips to the side with the bent knee, supported by the hand on the lead hip. Point the toes of the extended leg and stretch the opposite arm along the floor for balance. What is the symbolism of the lotus flower? How do I get comfortable in lotus pose?